Red rock country, right? Temps in the low 100°F’s, right? Four wheeling and hit those trails, right? Well, maybe not in winter. 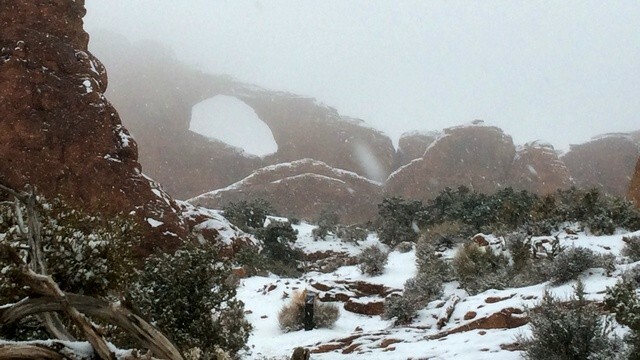 Loretta and I took our Christmas retreat this year in Moab—and got right properly snowed on. 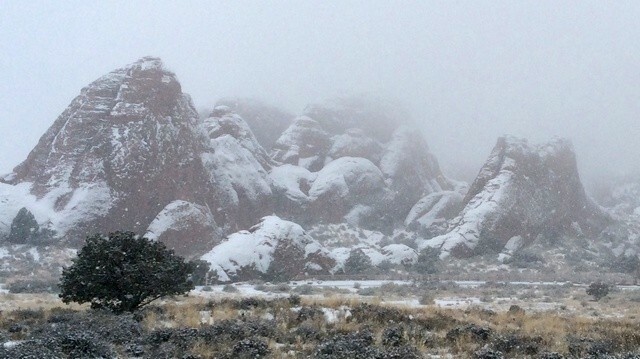 Add snow and fog to the red rocks and out come some wonderful views not available to all those who throng Moab “in season.” Here are 11 examples, all taken with my iPhone 5S. We toured Arches National Park on Christmas Day. The Park was wide open, but there were no attendants at the gate. That meant free entrance. It also meant no map. We thought we’d have the place to ourselves, but not so. Lots of California plates, and lots of Asian tourists. Everyone was very friendly. Arches National Park: Balancing rock. Note the blue arrow and circle in the lower left hand corner. That’s a tourist to give some perspective. There are other tourists closer to the formation that are barely visible, so, yes, it’s really big. You will never catch me throwing a sleeping bag under this one and pretending to be able to sleep! Arches National Park. An arch. Without a map, I can’t name it. Do you know the name? This is what it looks like from pretty close to the road. I point out that the snow did not cover only the formations, but also the road. We had our 4WD Blazer and were glad we brought it instead of the Prius. 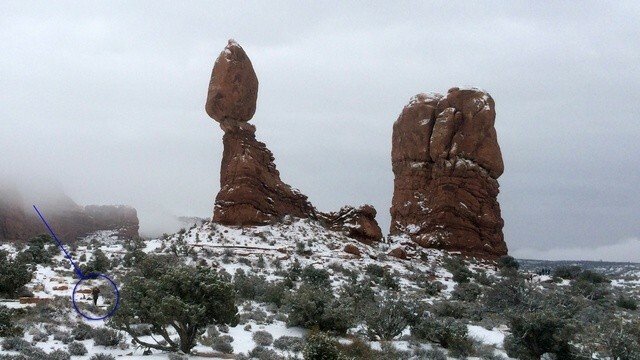 Arches National Park: rock formations with snow cover. The rocks are deep red. 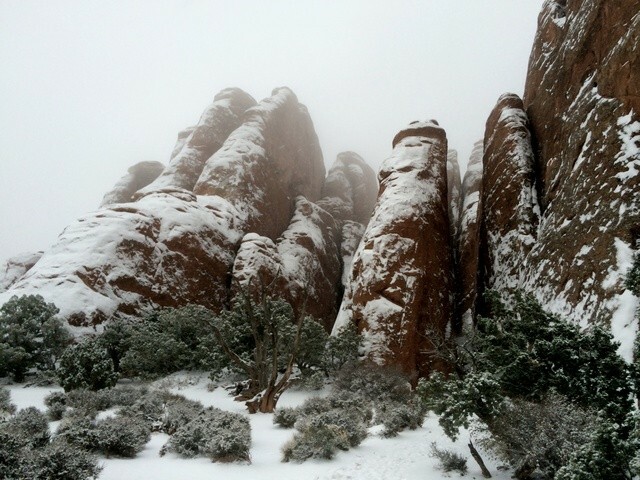 Arches National Park: Devil’s Garden in the snow. We went other places, too. 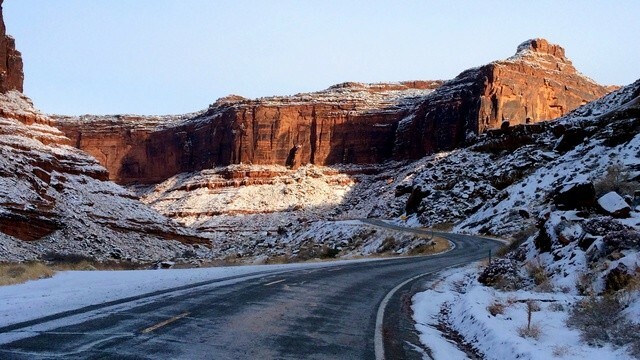 We took Potash Road to the west of Moab. 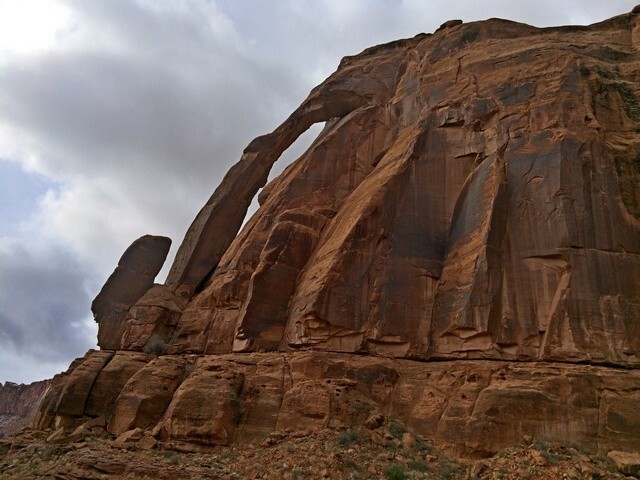 Moab, Potash Road: Jug Handle Arch. You can see why it has the name. 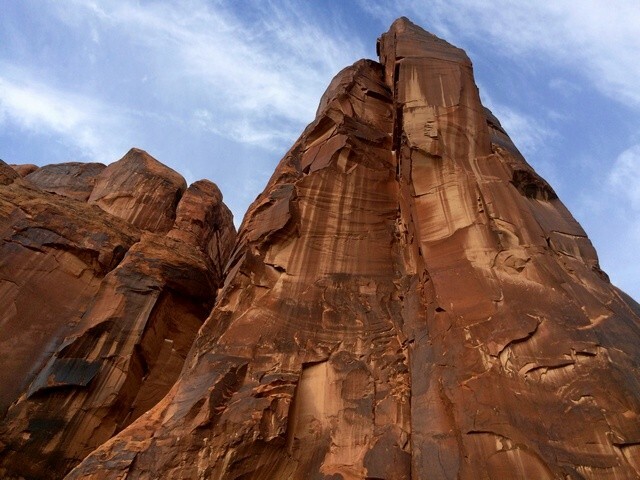 Moab, Potash Road: Some large rock formations across the river. I like the way the snowy edges line up parallel to each other. 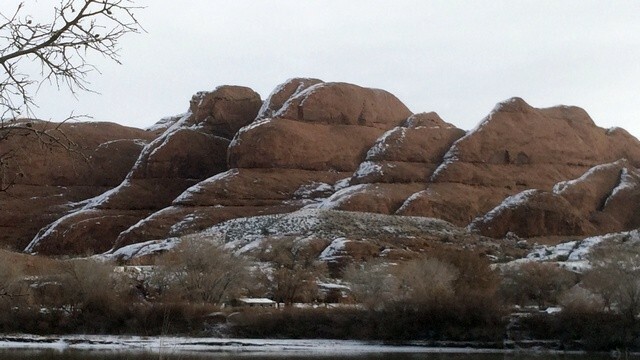 Moab, Potash Road: Big rock. I mean BIG rock, right by the highway. Hundreds of feet tall. Okay, I’m an engineer, so like all other geeks, I like trains. There’s a track running to the potash mine that runs, appropriately enough, along Potash Road. 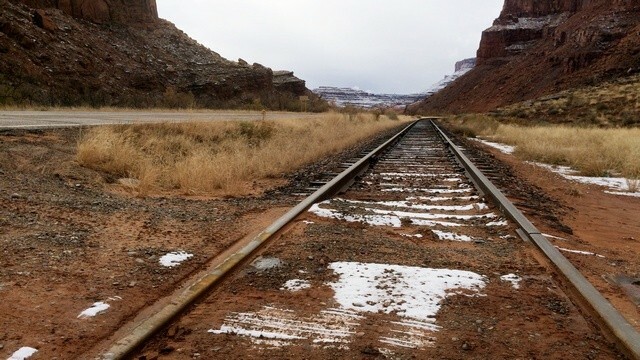 Moab, Potash Road: railroad tracks leading to the potash mine. 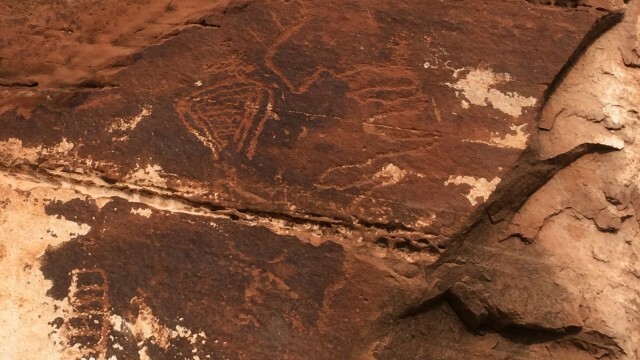 As a reminder that we are not the first people to discover the area, there are “Indian writings” (that’s what the highway sign said). Moab, Potash Road: “Indian writings” is what the highway sign said. Lastly, here are a couple shots taken along Utah Highway 128, which runs along the Colorado River from Moab to the northeast. 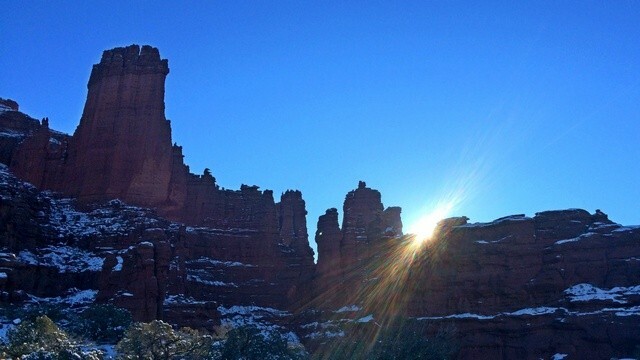 And, finally, here’s the sun rising over Fisher Towers. Okay, so it was a bit later in the morning, but I still caught the sun just peeping over the towers. This one is cropped slightly differently from the one I put on Facebook. Moab, Highway 128, Fisher Towers, taken as the morning sun peeks through. It was a wonderful trip and we had a great time. Now, we need to return when it’s warmer and the trails are dry! This entry was posted in Personal, Utah and tagged Arches National Park, Moab. Bookmark the permalink. Great photos!! I’ve been to Moab and Arches, but not the other places you’ve mentioned in other blogs. We went there with our son in January 2009, and it was actually quite pleasant–some sprinkles of snow, but the temperature was in the 40s-50s… beats the “frying eggs on a flat rock” temperatures of the summer months. One suggestion… next time you’re in the area, drive down to Newspaper Rock, which is a little Northwest of Monticello. Paved road to get to it, and very interesting… huge collection of Indian petroglyphs. The arch that is in the picture is called Skyline Arch. What beauty in God’s creation !! Great photos Dave !!!! We travelled through this area in 2010 on our 50th, we came close to you Dave as we took the train to Silverton, we loved that little town nestled in the Colorado mountains.